As we've moved through Coin, we pointed to a few books as helpful resources and catalysts for thought and conversation. This week, I (Dave) will be posting a few thoughts from these books and summarizing the contribution they make to the wider conversation about following Jesus with our money in an economically-driven world. If you've picked up either book or have thoughts on what's posted here, please jump into the conversations (in the comments section below, over email, or a cup of coffee!). William T. Cavanaugh is a Catholic scholar who teaches at DePaul University in Chicago and has written extensively about formation, liturgy, and the way we are shaped by the culture that surrounds us. His book Being Consumed is an incredibly helpful guide for thinking about how we're shaped by economies and what faithful discipleship looks like in the 21st century world. It's a bit heady at times but constantly moves back to practical, everyday questions, examples and stories of an economic way of being faithful to God in the world. In Being Consumed, he addresses the way capitalist, consumer-driven economies shape and form those residing within it. He explores the ideology of free-market economics, and suggests, contrary to their name, free-markets are not actually free. Because they create, shape, and perpetuate desire in such a way that maintains a certain status quo, their end goal is freedom, but only in a very limited sense of the word fitting within the market-shaped and -enforced rules and norms of society. In contrast, Cavanaugh explores the work of early Christian theologian Augustine of Hippo, who (Cavanaugh suggests) names that true freedom is "fully a function of God's grace working within us. Freedom is being wrapped up in the will of God, who is the condition of human freedom" (8). Connecting freedom and desire, Cavanaugh distinguishes between arbitrary desire and intentional desire. Arbitrary desire is desire for desire and consumption's sake (e.g. the economy is in trouble, buy something - anything!) or for a shallow end (I have a deep longing and no idea how to fill it, I'll try television). Intentional desire is shaped by a vision for the ultimate purpose or goal, a desire not divorced from a vision for greater/ultimate meaning and purpose. 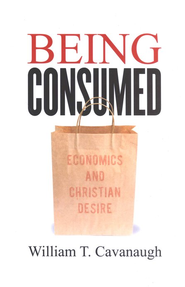 "Consumerism is an important subject for theology because it is a spiritual disposition, a way of looking at the word around us that is deeply formative" (35). Unique to our American context is detachment. As a country, we're more in debt than almost anyone else and, as individuals, we save less than almost anyone else. We continue to, ourselves, produce less and less of our own 'stuff' and instead consume what others are producing, and our system is designed such that those who are doing much of our producing are invisible to us. Yet Cavanaugh recognizes "there is no question about whether or not to be consumer. Everyone must consume to live. The question concerns what kinds of practices of consumption are conduce to an abundant life for all" (53). So the choice is not whether we consume or do not consume. Instead, we must ask the right questions about what our participation and consumption in the world looks like. Cavanaugh suggests our default way of interacting in the world is as a tourist - "detached from all particular times and places...[craving] what is different and authentic...the tourist can go anywhere, but is always nowhere" (74). In contrast to the always-but-never-present tourist, Cavanaugh points to the paradox of Jesus who is both fully universal and particular: "Christ is the infinitely integrating one who makes room in himself for everything truly human" (78). Cavanaugh writes that, as followers of Jesus, "we cannot stand back from the world and survey it; we must simply take our role in the drama that God is staging and give ourselves to it" (81). We do not become fully universal/particular in the same way that Jesus is, but we point to him with actions that "'realize' the universal body of Christ in every particular exchange" (88). Examples given include types of co-ops, fair trade, and community-supported agriculture. Our word economy comes from two Greek roots: household and management. So 'economy' is rooted in the practices and ideas that help a household (a family) flourish. It involves money, but it's also bigger than money. Economy is about money, relationships, possessions, and more. The last two weeks at Open Door we've talked about the idea of an economic imagination - the realization that the 'economy' we exist in has a particular vision or imagination for 'the good life' or life's ultimate goals or purpose. That imagination will inevitably form and shape our everyday economic practices - how we buy and sell, where we choose to live, how we relate to those around us, etc. Capitalism has a particular imagination (involving retirement, self-sufficiency, upward mobility) which lends itself to particular practices (investing, consumption, seeking promotions, etc.). In the same way, Jesus invites us into a particular economic imagination. The 'good life' that Jesus invites us into (life 'to the full') is marked by a pervasive and holistic shalom, love of neighbor, faithful stewardship of what we've been given, trust and reliance on God's abundance, and a family formed around Jesus. This Jesus-looking economic imagination invites us to consider certain economic practices that move us deeper into this kingdom imagination. This past weekend, we continued our conversations about money, economy, and following Jesus with a focus on naming some of these specific practices and action steps we can take as a family - particularly those centered around Abundance and Sharing/Community. Here are a few of the practices we named to help us live deeper into a Jesus-looking economic imagination. Journaling a daily gratitude/thankful list. Dwelling in our identity as God's beloved child. Developing a baseline for what is actually 'enough' (based on global averages, actual needs, etc.) and taking an inventory of possessions and actions to simplify. Bringing meals to those with new babies, in transition or in crisis. Believing God can do more with what you're willing to offer than you can imagination. Taking steps of practice in these areas, I believe, will move us deeper toward the life that Jesus invites us into. These simple steps are the stuff of faithfulness in God's kingdom economy! What other practices would you add to the list? How have you experienced growing depth towards a new economic imagination as you take steps of faith with our money, possessions, and resources?